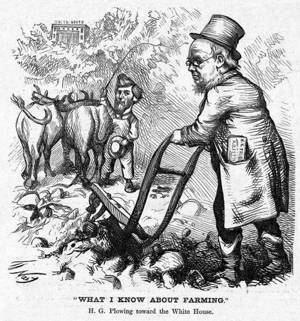 Nast’s second cartoon about Greeley’s potential candidacy in the June 24, 1871 issue was “What I Know About Farming.” In it, Greeley is “Plowing Toward the White House” along a rocky path through field and woods behind a pair of yoked oxen. Greeley lived on a farm, about 35 miles north of New York City near Chappaqua, where he applied experimental scientific methods to agriculture. In early 1871, he published his findings in a book [link to book title page] called What I Know of Farming. Nast played on the title (slightly changed) in a series of cartoons incorporating “What I Know About…” [link to section] to mock Greeley’s pretension to expertise on various subjects. Here, in a foreshadowing of the impending bolt of the Republican liberals, the draft animals are guided by the whip of Senator Reuben Fenton of New York, who shared Greeley’s aversion to Grant and was an early supporter of the editor’s presidential campaign.